Mary & Gerhard Michler are delighted to announce the hiring of Executive Chef Allison Owens for their popular San Francisco Dogpatch Café, Jolt’n Bolt. Executive Chef Allison Owens comes to Jolt’n Bolt with an impressive culinary background. She is a graduate of the Culinary Institute of America in Hyde Park, New York, which Julia Child herself referred to as the “Harvard of cooking schools” and her past work experience includes stints at the famous Waldorf Astoria in New York, the Palm Springs Country Club and consulting on opening many restaurants and gourmet food shops across the country. Allison’s past experience also includes working for six years as a sous chef for premier San Francisco catering company, McCalls Catering/Events Management, and owning her own South of Market Café. 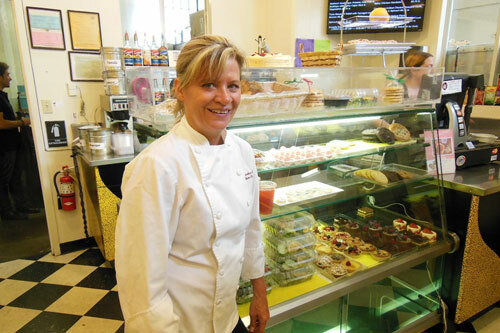 At present, in addition to her current position with the Jolt’n Bolt Café, Allison continues to own and operate her own successful San Francisco Bay Area catering business, Elite Occasions. Outside of work, Allison enjoys working out at the gym, snow skiing, taking her rescue dog Marissa for walks in Golden Gate Park and on the beach, and going out to dinner in restaurants and having others cook for her. Since Chef Owen’s arrival at Jolt’n Bolt, she has revamped the menu to reflect her version of California cuisine, brought in her long time sous chef and high quality vendors, added more “made from scratch” dishes, salads and entrees, many from her own catering recipes, and plans each day’s menu according to availability of locally sourced quality seasonal ingredients. Even the salad dressing is now homemade. When asked why people should come to Jolt’n Bolt, Allison states that “we provide good tasting, high quality, made from scratch food and European desserts prepared by classically trained chefs, at extremely reasonable prices. Our menu includes light breakfast items, espresso drinks, pastries, salads, homemade soups, sandwich specials, quiche and 3 or 4 daily entrée specials that change daily, like salmon with vegetables and angel hair pasta, Israeli cous cous with grilled romaine asparagus pineapple, and café favorite, rotisserie chicken with fingerling potatoes”. Customers have noticed the changes and response has been phenomenal with lunchtime lines frequently out the door. 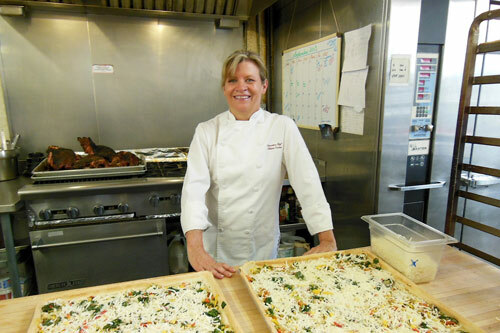 Interested in having Chef Allison Owens provide catering services for your next event or party? Feel free to contact her at (415) 244-3663 or via email chefalli@mac.com.